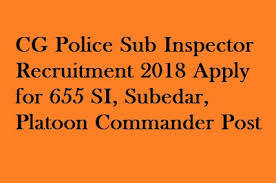 Hey Guys, are you keenly waiting for the CG Police Subedar Recruitment 2018? So, we have awesome news for all those aspirants who want to do a job in Chhattisgarh Police Department. Here, in this article, we are going to describe all the elaborated information related to the CG Police Vacancy 2018 in the following section of the article. Interested aspirants who want to do a job ion CG Police Department they may check this article, with proper attention and collect all the relevant details from here. You may apply online for the recruitment from the official website of the Chhattisgarh Police Department that is www.cgpolice.gov.in. For more elaborated information aspirants must bookmark our careerjobs360 official website and stay in touch with us for further use. The Chhattisgarh Police Department has released the employment notification for CG Police SI Vacancy 2018 to recruit eligible and skilled aspirants for filling up 655 numbers of Sub Inspector Computer, SI Radio and SI Documents Specialist, Platoon Commander, Subedar and SI Finger Prints Posts in the department. The Chhattisgarh Police Department is looking for the talented and skilled aspirants for the vacant posts in the Police. The aspirants can apply online for this CG Police Sub-Inspector Recruitment 2018 from the official website in the department. Candidates may submit the online Application Form through the online mode on or before the closing date which is 16th September 2018. Moreover, details regarding the CG Police Jobs 2018 like the eligibility criteria, required qualification, age criteria, age relaxation, application Charges, selection procedure and all other details are mentioned below. The contenders must go through these details before applying for the recruitment. For Sub-inspector / Sub-inspector (Special Branch) and Platoon Commander Posts: Candidates must have done Bachelor or equivalent degree from an authorized university. For Sub-inspector (fingerprint) and Sub-inspector Posts: Candidates must have done Graduate or equivalent degree of maths, physics, and chemistry from an authorized university by the govt. For Deputy Inspector (Computer) Posts: Candidates must have done Bachelor or equivalent degree from BCA (Computer) from an authorized University by a govt. For Deputy Inspector (Radio) Posts: Candidates must have a Three-year diploma or degree in Electrical Electronic Telecommunication Engineering from an authorized university by the Govt. For more details, candidates must have to visit the official notification of the recruitment. The minimum age limit for the aspirants is 18 years. The maximum age limit for the aspirants is 28 years. Age Relaxation: Upper relaxation in age will be applicable for the reserved category of candidates according to the government rules and regulations. Selection Procedure: The contenders will be selected on the basis of their performance in the Written Examination and Physical Test which is going to be conducted by Chhattisgarh Police Department. Pay Scale: Selected candidates will get handsome amount of pay band of Rs.35,400 per month. How to Apply for the CG Police Sub-Inspector Recruitment 2018? First of all, candidates need to go to the official website of the Chhattisgarh Police Department that is cgpolice.gov.in. On the homepage download the official notification CG Police Platoon Commander Recruitment 2018. Find the official link for the CG Police Sub-Inspector Application Form 2018. Enter all the details carefully on the application form. Upload the scanned copies of the documents as per the requirement and the passport size photograph and the signature. Keep it safe for future use.